All six seniors that are displaying their work this spring have shown their work in the past, including a similar exhibition in 2015 at Mill No. 5, also in downtown Lowell. Gibbs and Sheehan were undecided as to whether or not they will be pursuing art in college. “Study art: I don’t know, but do art: yes,” said Sheehan. Sorrentino, Miller, and Cook, however, will both be pursuing art not only in college, but also in their subsequent careers. “I’d like to teach visual arts, maybe starting out at the high school level, and then hopefully moving up to teaching college courses… that would be nice,” said Sorrentino. Miller and Cook will both be majoring in illustration, and hope to take the skills used in that area and apply them to their future work. 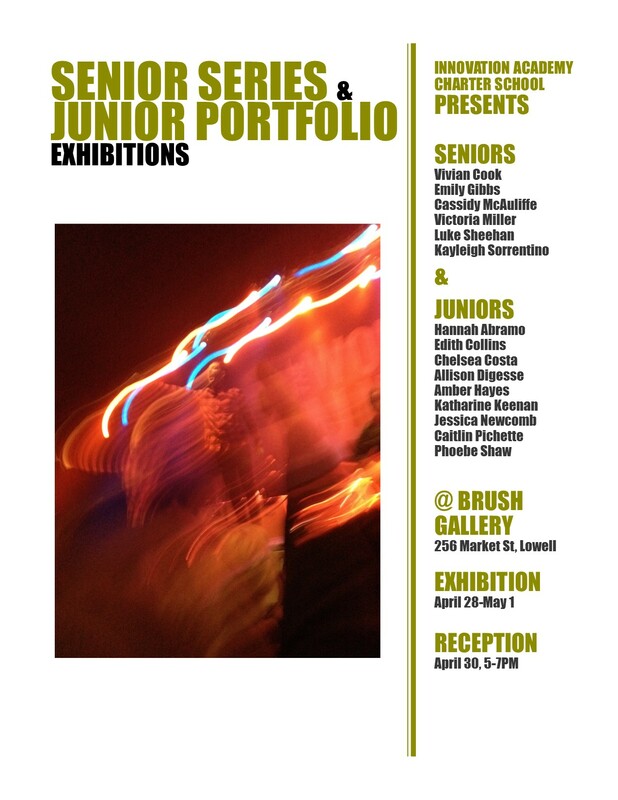 Make sure you see them at their reception on April 30th, from 5-7 PM, at the Brush Art Gallery! Next Next post: X2 Notifications- Electronic Distraction or Helpful Tool?